Three Miles Vorkosigan Adventures "The Mountains of Mourning" is a Hugo & Nebula award-winning novella. Just after graduating from military academy, Ensign Miles must take on one of his duties as a Barrayaran Vor Lord by acting as detective and judge in a back-country murder case. In "Labyrinth," Miles travels to Jackson's Whole on a covert mission for Barrayar as Dendarii Mercenary Admiral Naismith. His mission to rescue a top research geneticist is complicated by the doctor's insistence that one of his experimental creatures be destroyed first. "The Borders of Infinity" finds Miles in a Cetagandan prison camp. But why is he there? How does he handle captivity? And will he make it out alive? 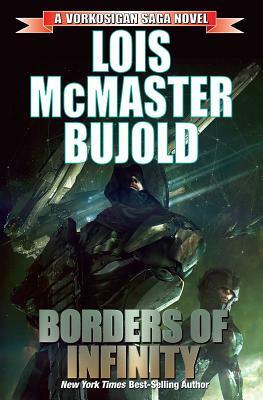 A science fiction legend, Lois McMaster Bujold has won six Hugo Awards and three Nebula Awards. Her Miles Vorkosigan saga is a massively popular science fiction mainstay. Her many New York Times bestsellers including previous series entries Cryoburn, Diplomatic Immunity and Captain Vorpatril's Alliance. The mother of two, Ms. Bujold lives in Minneapolis.